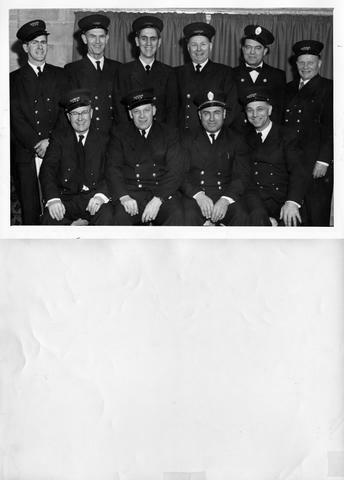 One photograph of the Garson Volunteer Fire Brigade. Seated in the front row from left to right are Courtney Gregg, Lorne Bronson, Orlando Rinaldi and Jack Heit. Standing in the back row from left to right are Art Caswell, Pete Van Heukelom, Gus Della Vedova, Sam Gillis, Jack Hayes, and Urho Nasi.